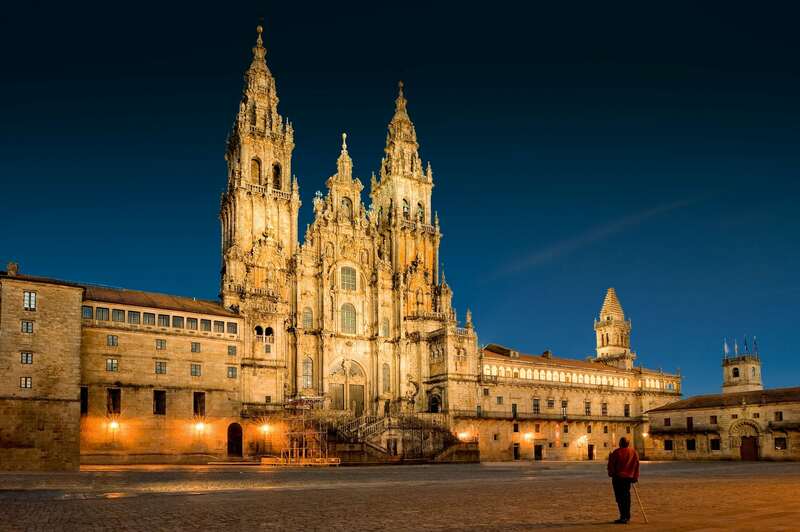 The Cathedral of Santiago de Compostela is the result of more than 700 years of construction. This architectonical jewel is the fruit of different styles and expansions, and continuous restorations. 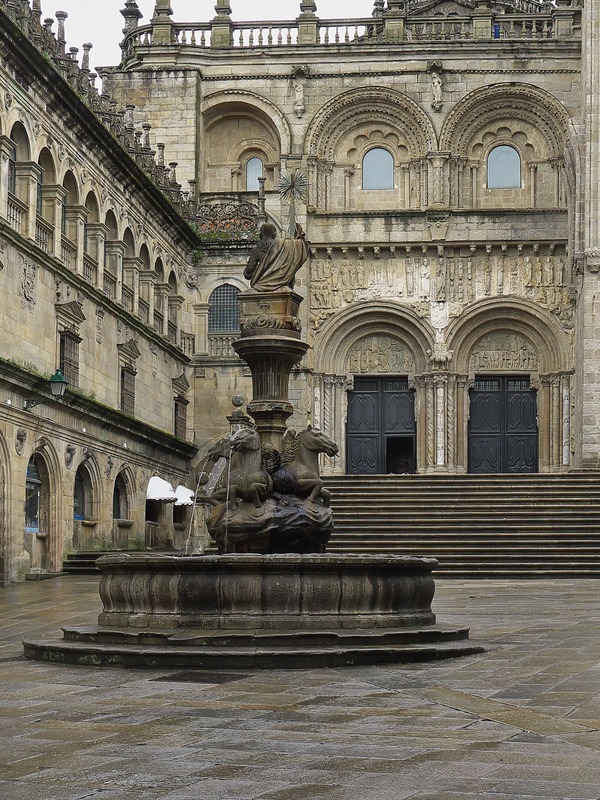 When we talk about the protohistory of the Cathedral of Santiago de Compostela, we must mention two pre-Roman churches built on the IX century. The construction of the basilica that was the origin of the Cathedral as we know it nowadays, started in 1075. It started with the figure of Bernaldo o Vello, who was the leader of a team of quarry workers. However, the great impulse of this construction came after that, when Diego Xelmírez was the archbishop of Santiago de Compostela. 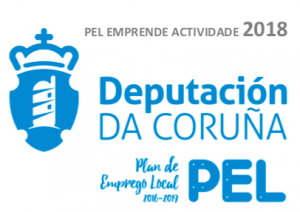 He was an educated and cosmopolitan person, and stand out as a cultural and spiritual promoter of Santiago de Compostela. The basic stru cture of the building (the head, the main altar, the arms of the crossing and the radial Romanesque chapels) were already finished when he died (in 1139 or 1140). The Cathedral is inspired by the great churches of France. It was subject to the most updated architectural techniques of the Western World. 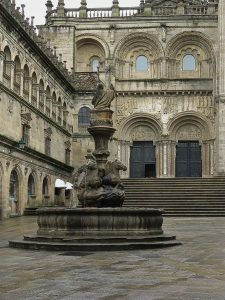 In fact, it was the first Romanesque church in Europe with a monumental sculpture on the three façades: Obradoiro, Platerías and Paraíso (nowadays, Azabachería). 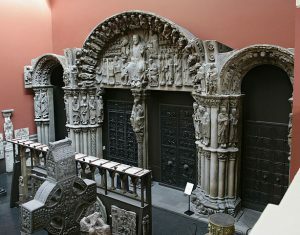 Moreover, the Portico de la Gloria (Arcade of Glory) is one of the most spectacular demonstrations of Romanesque art in Europe. The author of this jewel was Maestro Mateo (an architect from Santiago de Compostela) and his team . They worked for more than 40 years on this piece of art, from 1168 to 1211. And, after so many years of works, they left a poem made of stone to be enjoyed by all the future generations. This stone-made jewel, is not just a manifestation of the medieval art, but also a summary of the human conception and the universe. It is presented on a architectural structure made of three superimposed floors. In XVII took place the last great renovation of the Cathedral of Santiago. On the one hand, it was to protect the Portico de la Gloria. On the other hand, to create a western structure, appropriate to the significance of the temple. This way, the Baroque façade was built. Fernando de Casas Novas was the designer, and the construction was finished in 1750. This Baroque style provides the sense of verticality to the building, of elevation. It also combines glass and stone in a way that had never been done before. The Holy Year in 1784, marked the conclusion of the works, and the unveiling of the Communion Chapel. Also, one of the most iconic parts of the Cathedral of Santiago, is the Clock Tower, or Berenguela. And, of course, the Porta Santa. But in this case, it is only possible to access the Cathedral through this door during the Holy Years. Once inside, we recommend to hug the statue of the Apostle, and go down to visit the crypt that keeps his remains. 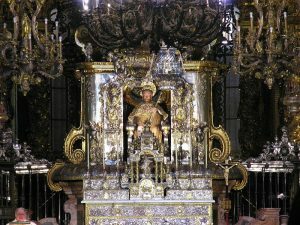 Furthermore, the visit to the Royal Mausoleum and the Pilgrim Mass (if you are lucky you will be able to see the Botafumeiro), and the chapels, are some of the highlights. There are also hidden surprises, like archaeological excavations that started to be open to the public in 2011. This way, it is possible to access the subsoil of the cathedral to visit the medieval cemeteries. 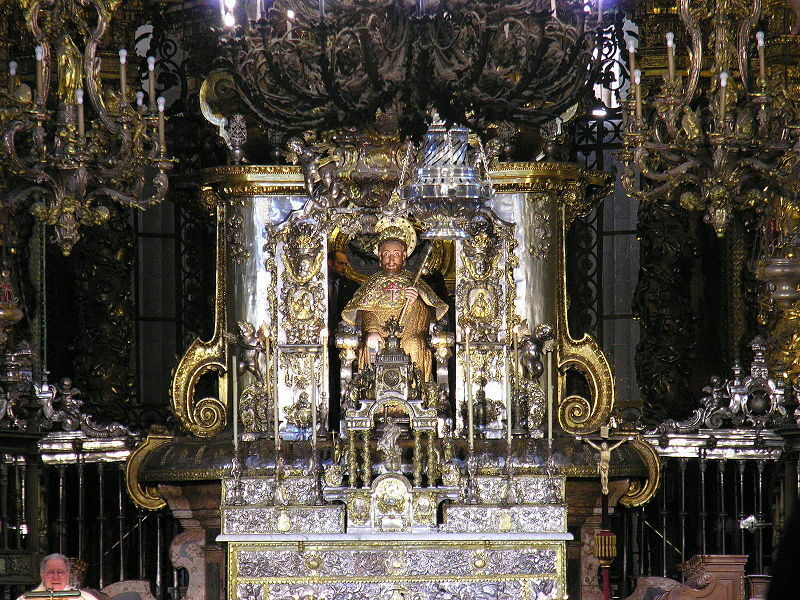 In fact, this settlement was the origen of the Cathedral of Santiago de Compostela. Have you visited the Cathedral of Santiago? Which was your favorite part of the building? If you want to visit the city, please do not hesitate to contact us here. We will get back to you with the perfect itinerary!